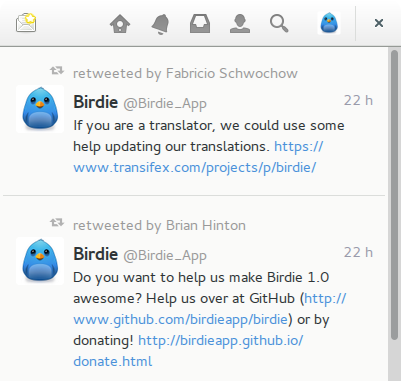 Birdie is a free, open-source twitter client for Linux. It makes use of native technologies like Gtk and GLib to provide a pleasant experience to the user, while integrating seamlessly with the user’s desktop environment. So far, the latest release is birdie 1.1 which features performance optimizations, better thumbnails, bug fixes and updated translations. This simple tutorial will show you how to install it in Ubuntu 14.04 via PPA. The deb packages for Ubuntu 13.10 and Ubuntu 14.04 are available in github.com. The PPA so far only support Ubuntu 14.04 Trusty Tahr. No user responded in " How to Install Birdie Twitter Client in Ubuntu 14.04 "